Who would win in a fight? Captain Imp (also known as Buccaneer Imp, Swashbuckler Imp, and Dread Pirate Imp) or Indiana Imp? The original plan was to have an octopus, but we decided that squids were funnier. Must be the arrow-shaped head. This entry was posted on Friday, January 8th, 2010 at 12:00 am and is filed under Comics. You can follow any responses to this entry through the RSS 2.0 feed. Both comments and pings are currently closed. The bubble bath would win. 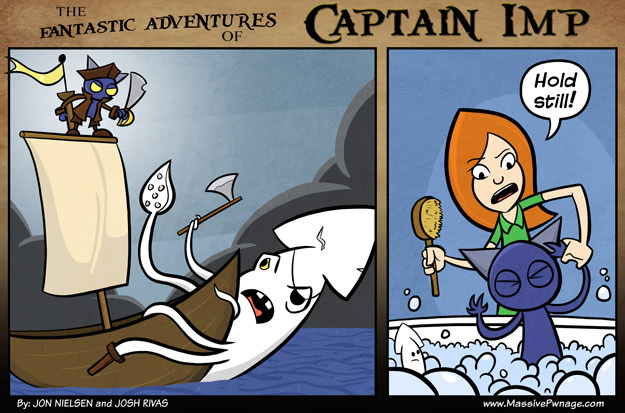 Woah, just noticed the mini squid in the 2nd panel! I’d say anybody else would be either dead or a pile of mush if they were trying to give the imp a bath .-.